The inside of a spacecraft is uniquely designed for the crew that is to live onboard. We will examine the inside of the space shuttle. The space shuttle is a manned spacecraft that is operated by the U.S. National Aeronautics and Space Administration (NASA). The first orbital flights of the space shuttle began in 1982. 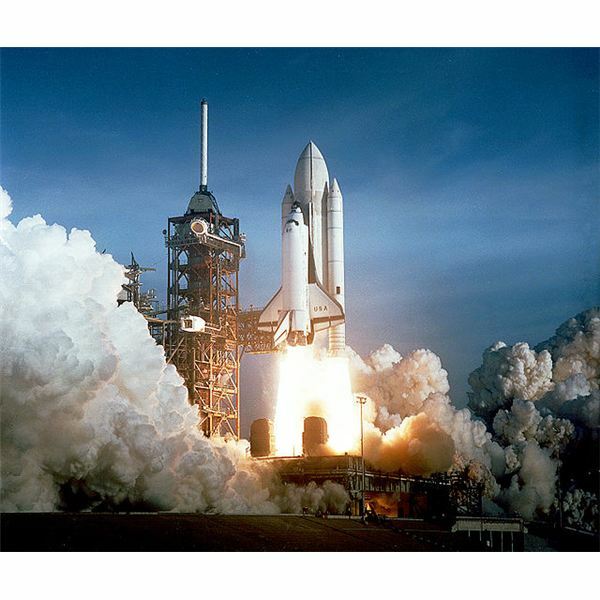 A regular space shuttle mission consists of launch, ascent, orbit, re-entry and landing. Average missions are seven days and sometimes can last for up to 14 days. The space shuttle is comprised of solid rocket boosters (SRB), which provide the thrust required to launch the shuttle, three main engines, responsible for providing the remainder of the thrust required to launch the space shuttle, maneuvering engines, which are used maneuver the space shuttle into final orbit and slow it down during re-entry, and the external fuel tank, which provides the fuel for the main engines. There are various systems within the space shuttle designed to keep everything in check and the shuttle often carries payloads that are delivered once in orbit. For the crew of the space shuttle, the interior is uniquely designed and is primarily composed of the lower deck, the mid-deck and the flight deck. We will look at each one of these a little more closely. The lower deck of the crew compartment primarily contains life support systems, electrical systems, environment control, waste removal, fire protection, communication and radar systems used for docking and other systems that are vital to the proper functioning of the space shuttle and its crew. Chemical canisters, which remove carbon dioxide from the environment, are located here and are changed every twelve hours. A cabin heat exchanger is also located in the lower deck, which cools the air and condenses the moisture it contains. Water onboard the space shuttle is made from liquid hydrogen and liquid oxygen, which are in fuel cells. Once the water is made, it is stored in storage tanks, which are located in the lower deck. The mid-deck and the flight deck are the living and work quarters of the crew. Once you enter the mid-deck, the first things you notice is the restroom – or personal hygiene compartment. The restroom has a curtain that is rolled up for the privacy of the astronauts. The left-side contains an entry hatch and as you continue along the shuttle you will see a front wall that has cabinets and drawers. The cabinets have Velcro strips, which help to keep things from floating around. Drawers have a mesh covering that helps to prevent things from floating around. The mid-deck also has a galley or kitchen. This is where the food is stored. The kitchen has storage compartments, food warmers, an area for preparing food with warm and cold water outlets and metal trays for the food to keep it from floating. The mid-deck also has storage lockers for the crew and a exercise equipment, which the astronauts use regularly to keep their muscles from deteriorating due to the lack of gravity. The shuttle also has laptops which the astronauts use for work and for communication purposes. 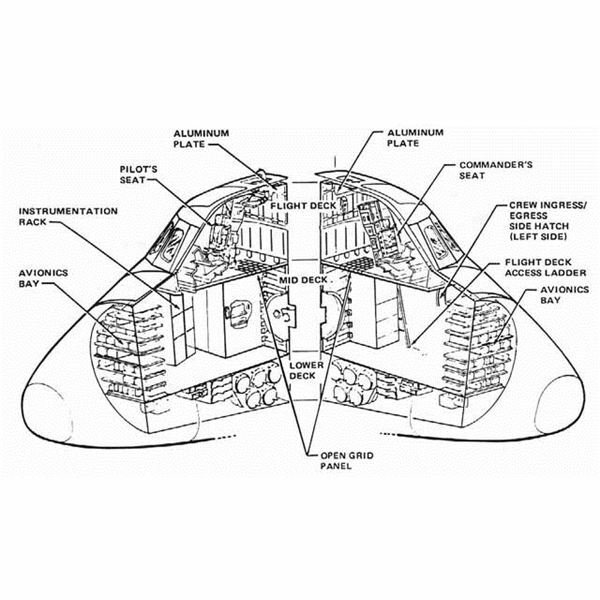 The flight deck is the control center of the space shuttle, located above the mid-deck. Here the mission commander and the pilot control the space shuttle and the mission specialists control the shuttle's robotic arm for moving objects in and out of the cargo bay. The control panel for the robotic arm is located on the wall on the left. Two windows above the control panel give the astronauts a view of the cargo bay. The front of the shuttle, or the nose, is where you will find two seats. The left one is for the mission commander, while the right one is for the pilot. The inside of the shuttle contains various other equipment as well. The shuttle has electrical heaters to heat different areas, lines, valves and pumps that transport collected heat, heat exchangers that collect heat from equipment, smoke detectors on each deck, fire extinguishers, breathing apparatus and insulating materials such as blankets. The design of the shuttle is quite unique and stands the test of launch time and time again.